HOTT TOPZ are avialble for shipping only in the United States at this time. INTERNATIONAL SHIPPING COMING SOON!! Custom orders are available and take about 2 weeks or less to complete. Prices do vary on custom orders due to size, shape and style. If interested in a custom HOTT TOP please contact Lindsey at email address provided under the "contact us" tab. What pirates dont love diamonds!?! Be a diva in this Bling Pirate inspired HOTT TOP which comes in black, with red accents. 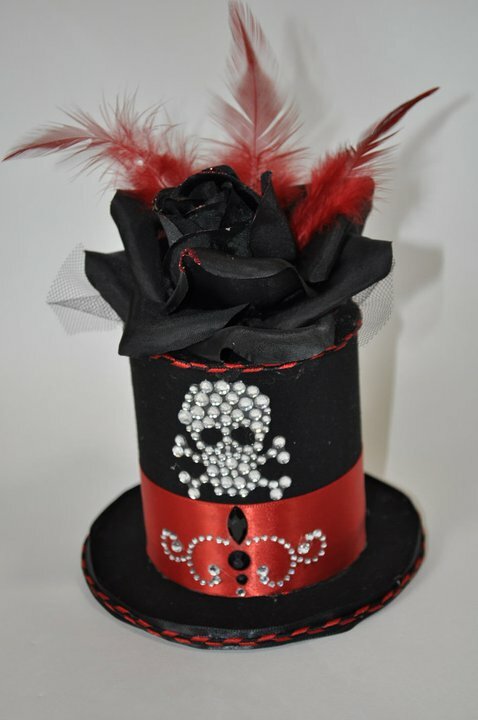 Black rose on top with feathers. Hair clip in peice for stability. 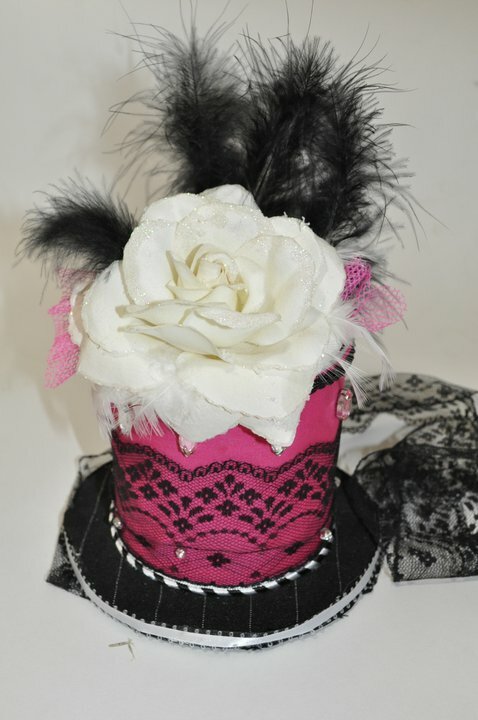 Made with black & white zebra print fabric, lots of bling, and black roses on top. Great for any party, event or photoshoot! This hat was designed for all those dancers out there and to match any outfit for any event. Can be order in any color!!! This specific hat is made in all black with lace, ribbon, and chain accent pieces. Clips in for great spability and movement! Large Pink Victorian Hott Top with Bling. Rose and feather top with lace tie strap for stability. Hair clip in avaiable upon request. Great as an accessorie to any pinup style outfit or photoshoot!! This beautiful Mariyln Monroe inspired hott top comes with 3 classic pictures of marilyn that round the hat and accented with pearls. Comes with an elastic head strap for great stability. 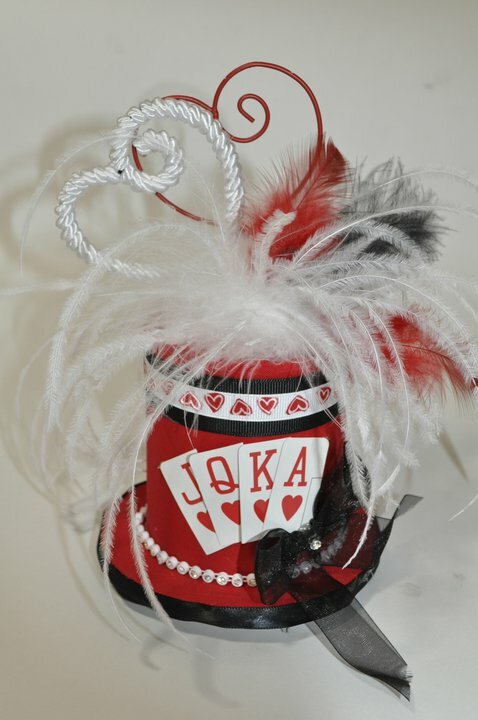 Small Queen of Hearts Hott Top with hair clip in peice. Great for rockin in Vegas for partyin with alice and wonderland! 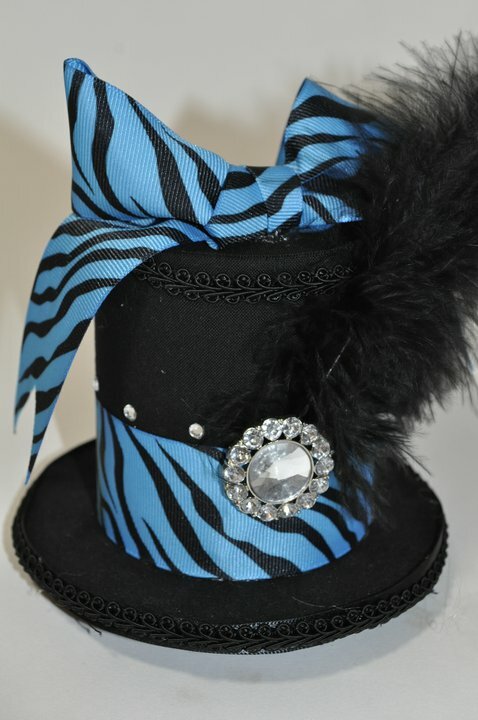 Small Black and Blue Zebra print Hott Top with Diamond embelishments and side feathers. Hair clip in peice for stability. Love Music? the 80's? A raver? whatever your style this rockin hott top will be perfect for any event you have coming up! Getting married soon? Having a night out on the town with the ladys? Worried about what crazy hat your maid of honor might make you wear? The worry is over! This bachelorette themed Hott Top is perfect your you last single night out on the town! All the Bling will make you feel like the Queen of the night and the veil is perfect for that Bride to Be!! NOW comes with a bachelorette Sash!